Good Words, for Good People ... Like You! Not perfect words, and maybe not great words, but good words—thoughtful, imaginative, hopeful, and sometimes even poetic—for good people like you. As a subscriber, you'll get periodic updates on Gray Rinehart's stories, songs, and ideas. 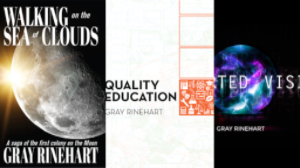 Plus, all new subscribers get three FREE thank-you gifts: the Quality Education INTRO e-book; an MP3 of my Dr. Demento song, "Tauntauns to Glory"; and my Analog story, "SEAGULLs, Jack-o-Lanterns, and Interstitial Spaces."